Reviewed by Sandy Andron, Ed. D.
Early in the text, and throughout the pages of this book is a litany of quotations that suggest that there were multiple agendas early on as the Krishna organization was gaining impetus. If "absolute power corrupts absolutely," as Lord Acton suggested so long ago, then the leadership of the movement might well be worshipping at that altar rather than at Kirishna's. 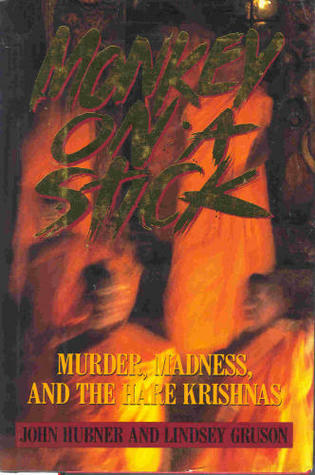 Hubner and Gruson rightly point out that the Krishna movement degenerated into a number of competing cults that have known murder, the abuse of women and children, drug dealing, and swindles that would impress a mafia don.” Judge Howard Munson, cited in the notes (p. 387), in a 1980 case, expresses similar concern about the duplicity of the Krishnas. The title of the book comes from an Indian parable. It explains that when a monkey steals bananas from a plantation in India, the farmers kill and impale the monkey on a stick as an example to other monkeys to stay away. Leaving it thus on display, the message to others is plain and obvious. One is reminded of the old stocks in Salem, of the witch trials, of branding, and of equally barbaric and merciless customs. Thus understood, however, we see the message as the caveat to members of the group not to defect, nay, not even to question the orders of the hierarchy. Some did. Some died. Examples in the book are myriad. Beneath the dhotis (Indian robes) and the shikhas (pony tails) were lurking minds which directed their devotees to steal even from one another. In response to accusations that stolen property was found in a member’s van, the remarkable response is, ‘And why were you snooping around our vans?”, and further, that the theft was perpetrated out of “Love for Krishna. They were simply taking what they had to have to use in his service.” And finally, “Krishna smiles on every endeavor, as long as it is done in his service.” Convoluted thinking. No? Airport solicitors were told- ‘I don’t care what you do, as long as you make your quotas.” Devotees who recoiled from questionable Krishna solicitation methods were told that they were simply exercising their First Amendment religious expression rights, and those who were still reticent were kicked out of the movement. Justifying stealing by calling it ‘liberating it [money and goods] for Krishna" just doesn’t wash. Nor does the rationalization of drug smuggling: the leaders told followers that the drug money went to build temples, and the more temples there were the more converts there would be, and this would mean fewer drug addicts. One day, bingo, no more drug users. Such reasoning wouldn’t acquit in Logic 101! When arms caches which would equip a small army are found, when hate literature, larceny, and political totalism are discovered among the Krishna, when children are raped in front of other children and devotees are instructed that "three things are better when you beat them: your drum, your dog, and your wife," it is not surprising that deaths also occurred in the groups and that the seeds of destruction were planted just as surely as the corpses of recalcitrant followers. What motivated one woman to say she had played so many parts in so many scams that she felt like an actress in a second-string repertory company is not explained in this book any more than what prompted others to commit murder and still others to direct them to do so. But that is not for journalists to decipher. They are chronicling the degeneration of a would-be religious organization mired in what the Krishna themselves call maya (illusion). Far from their stated goal and ideal of egolessness, Krishna leaders sought power, even divinity. They failed. 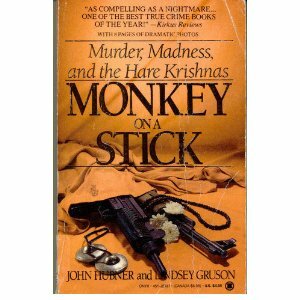 The vignettes on leaders and devotees throughout Monkey on a Stick - which connect the stories of many people by the ongoing investigation of a policeman - are at times confusing, since individuals’ Krishna names and former names are used interchangeably. But the book nonetheless reads well, and is often riveting, and the whole is certainly greater than the sum of its parts. For those interested or involved in cult-related work, the book is a must for your reading list. It is the definitive work to date exposing the inner workings of the Hare Krishna movement.